Tax relief up to RM6,000 for EPF and life insurance to be extended to the Private Pension Fund now known as Private Retirement Scheme. 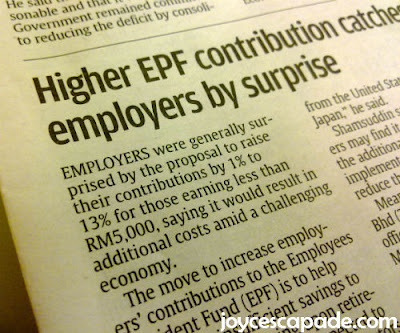 Employers' contribution be increased from 12% to 13% for contributors who earn RM5,000 and below, benefit 5.3 million EPF contributors. Under My First Home Scheme for those earning below RM3,000, government to increase the limit of house prices from a maximum of RM220,000 to RM400,000. Well, too bad I'm not qualified for this. 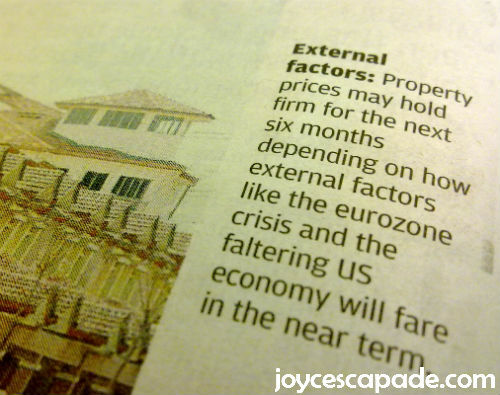 But then again, I found another article that says property prices may hold firm for the next six months depending on how external factors will fare in the near term. The property bubble might not burst. Let's just hope that property prices won't escalate like mad in the next six months to a year. Full exemption of import duty and excise duty on hybrid cars and electric cars will continue to be given to franchise holders. Tax exemption extended until Dec 31, 2013. Government will extend the compulsory retirement age from 58 to 60 years old to optimize civil servants' contribution. Payments for primary and secondary education will be abolished, making these free for the first time in our history. Book voucher worth RM200 will be given to Malaysian students in all private and public institutions of higher learning. To prevent cervical cancer, the Government will provide free Human Papilloma Virus (HPV) immunization nationwide. Senior citizens aged 60 years and above will be exempted from outpatient registration fees in government hospitals and health clinics.